Getting new dentures or implants is a big step. But the right dentures at the right price will change your life in a very positive way. 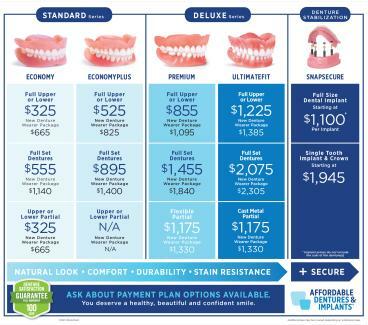 Take a minute to compare Affordable Dentures & Implants with the rest – you'll see why we're part of America's largest providers of dentures and implants. Now serving Ontario, Mansfield, Shelby, Ashland, Galion, Crestline, West Point, Lexington, Bellville, Jeromesville, Mount Vernon, Marion, Bucyrus and surrounding communities. If you're missing one or more teeth and you're ready to transform your life in a significant way, it's time to take advantage of the solutions available to you right here in Mansfield. Our practice is proud to offer a wide range of dentures and implants to patients who want to have great smiles without spending a lot of time and money. We're known in the industry for doing things right. While our local practice is independently owned and operated, we have the resources of America's largest denture provider. We're focused on continued innovation in affordability, speed, accessibility, and patient satisfaction. Whenever you visit our office for treatment, our caring professionals will treat you with the dignity and respect you deserve no matter how long you've been a patient. We've crafted thousands of dentures and provided implants that have given patients the youthful looks they want. Affordable Dentures & Implants is visited by patients from Ontario, Mansfield, Shelby, Ashland, and Galion who want life-changing dentures and implants at affordable prices. Since we have our own dental lab on-site, we don't have to use outside commercial labs for fabrications, relines, and repairs. We pass the time and money savings we get from having our own lab onto our patients. We can help change your life in as little as one day. Contact our office today to schedule an appointment. Simply bring your military ID or proof of service (or spouse’s ID or proof of service) with you to redeem your 10% discount. Susan Campbell, DDS, earned her Doctor of Dental Surgery degree at Ohio State University. Dr. Campbell and the rest of the highly trained staff at our office are focused on delivering compassionate care to patients based on years of experience in the field. We want you to have confidence getting your dentures or implant solution fabricated locally at our office.